You are three persons equal in being but subordinate in role. Each person is distinct, each person is fully God, and each person possesses the perfections of God in their entirety. You are three but one in purpose, agreement, essence, nature and existence. You are unified to the degree that you are one. You are God the Father, subordinate to none, from whom the Son proceeds, and who generates the Holy Spirit. You begot the “Ancient of Days.” You are ancient but still young, young but still ancient. You spoke words that created creation. You planned humanity’s redemption, sent your Son to do redemption’s work, and the Holy Spirit to complete it. You are God the Son, subordinate to the Father by will, but equal to him by nature. You are the LORD. You existed with the Father in your realm before time. When time came, you were the wisdom that designed creation. The Father created the cosmos with a commanding word, and you obeyed by doing the creative work. You were sent into time as a gift to people who neither understand nor deserve you. The divine wisdom, the logos, the Word became a human being – Jesus. You were an exact representation of the Father. You lived, were crucified, died, were buried, and resurrected. You accomplished the Father’s plan of redemption. You returned to your realm, but you have earned by your achievement the name that is above every name. When time ends, everyone will indicate by speech and posture that you are the LORD. You are God the Holy Spirit, subordinate to the Father and the Son by will, but equal in nature. You know the personal thoughts of the Father, and all the thoughts and activity of people. The Father commanded creation, the Son did the work, and you hover over it. You’re the omnipotent and all-invading presence throughout the universe holding every atom together. You generate time. You operate physics. You nourish life. You apply the redemption the Son bought, bringing the Father’s plan to completion. You live within us making us new from one degree to another. 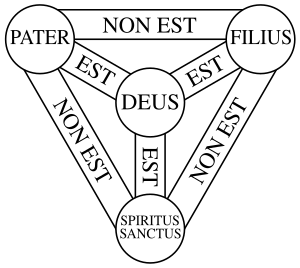 God, you are the God who is Triune, one God existing in three persons and you call your people to be one just as you are one.